There is a Chinese saying ‘Above is heaven, below is Suzhou and Hangzhou’ (Shàngmiàn shì tiāntáng, xiàmiàn shì sū háng 上面是天堂,下面是苏杭). I like Suzhou, but I am not sure it is heavenly. Anyway, we are off to Hangzhou on Thursday, so perhaps we will be able to see whether there is any truth in saying at all. 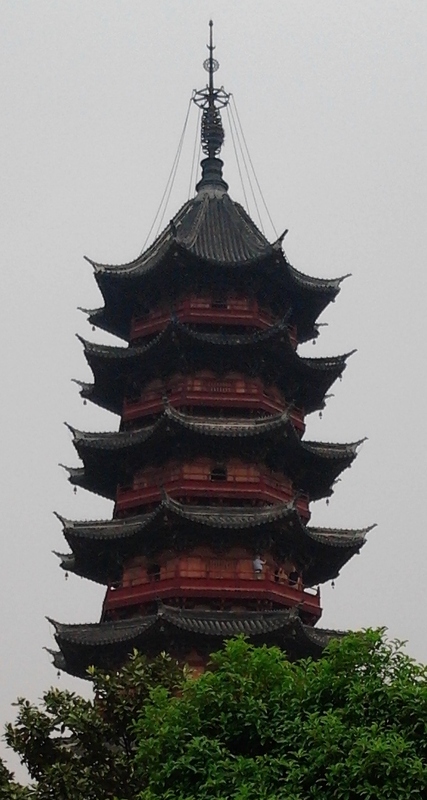 The photo is of the pagoda in the Pan Men Garden in Suzhou. If you look very closely, you will see it has been overrun by Kennedies. I just found this picture on my phone of my Valentine’s Day present from John. Thought it was worth posting. 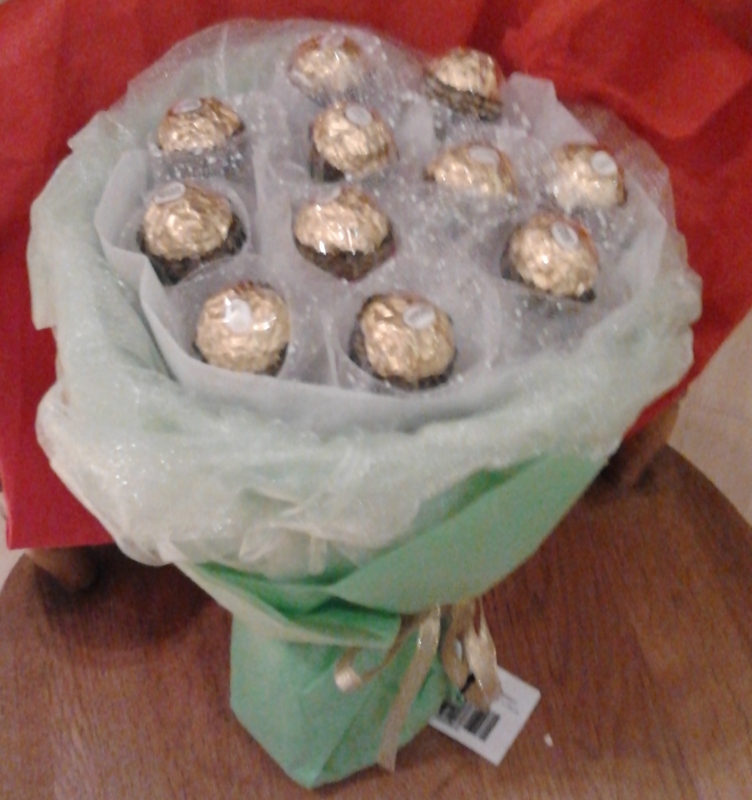 How efficient to combine a bouquet and chocolates into one gift. 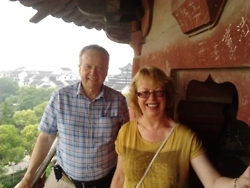 On Saturday we (well, John) decided it would be a good idea to walk to the top of Hui Shan, a mountain on the edge of Wuxi. We got up nice and early so we could avoid the midday heat, we also thought it might be a bit quieter first thing. We reached the park at the bottom of the mountain well before 8am and the place was absolutely heaving. There were hardly any spaces to park our bikes. The park was swarming with people doing Tai Chi (with swords), dancing and generally milling about. The mountain path has stone steps all the way up. The lower steps were really busy. There were even stalls on either side of the path selling fruit, snacks and various random items. The crowds thinned as we got higher. The steps were pretty steep and as we made slow and steady progress, we were occasionally overtaken by a wiry Chinese grandfather who looked like he jogged up the mountain every morning. At the top was a cafe where we stopped for tea and to admire the view. It was a bit hazy, but well worth the effort. There are fruit shops and street vendors selling fruit on every corner in Wuxi. Even in winter the selection was varied and interesting. Now summer is settling in, the shelves are heaving with tempting things, many of which I have never seen before. 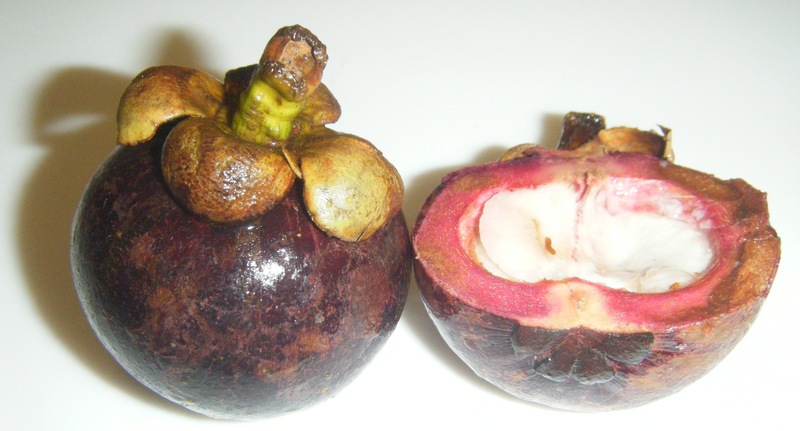 For example, the picture is of a mangosteen. Only the white bit inside is edible, the purple rind is really bitter. The flesh is really sweet and juicy and a bit mushy. Yum. My favourite, though, are the melons. Last week the temperature reached 34 C, plus humidity, so the piles of watermelons outside shops were just irresistible, although I nearly collapsed carrying one home. We have had a busy few weeks from the end of April up until now. John’s parents were visiting from the UK. 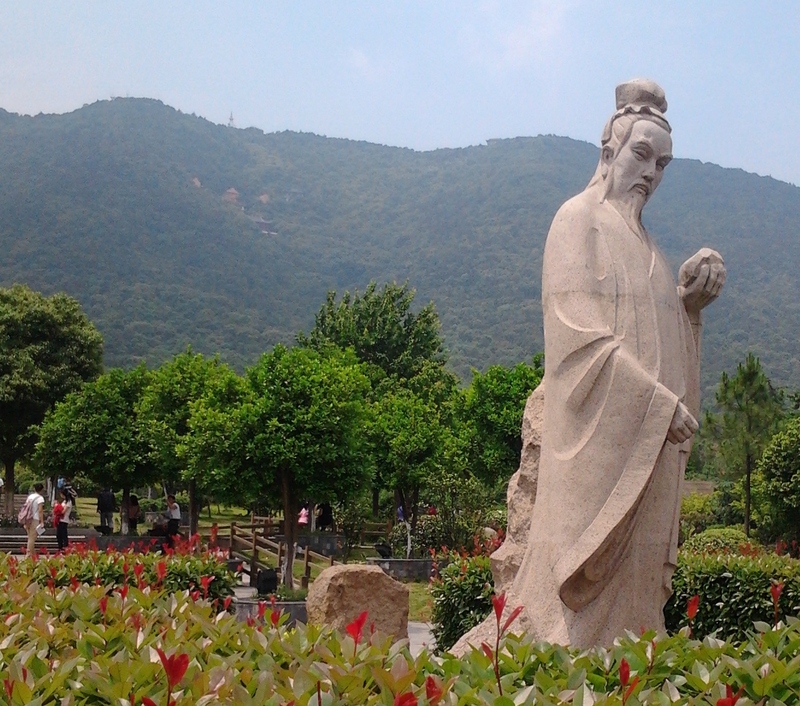 It was great to be able to introduce them to Wuxi and environs. They have been to Hong Kong before, but never to mainland China. They made the most of their time by arranging a tour of Beijing, Xian and Guilin while there were here. They are currently spending a week in South Korea, but will be flying back to Shanghai for one night only on Saturday. Hopefully we will get the chance to show them the lights of The Bund at night time. The view really feels like something from the future. I think they have enjoyed their time in China. I was very impressed at their language skills. We arranged a brief lesson for them with my teacher, Grace, and afterwards they were ni hao-ing and xiexie-ing like natives. I also admired their chopstick skills, I don’t think there is a noodle or peanut in China that could get the better of them. It will be sad to say goodbye on Sunday, but we will be seeing them soon, as well as lots of other friends and family. We have made the decision to move back to Europe this summer, rather than staying for another year. John has a job at a school in Lausanne and now I just need to find something for myself. We will be leaving China on 21 July in order to spend a few weeks in the UK before term starts. Anyway, we have a lot to do before then. John’s students are now in the middle of exams and I have my own exam booked for 17 June (HSK level II), so all being well, I should have something to show for my studies. We planning a tour of Yunnan Province before we leave. It will be good to have an adventure before we go.